Challenge: Six Sigma® process mapping didn’t get to the root of customer experience disconnects. With four divisions spanning three continents, this commercial lending division of a Six Sigma-driven Fortune 5 conglomerate needed to improve the process of managing customer experiences, relationships and satisfaction. With $30 billion in assets and processing over $4 billion a year in new loans, the total number of customers was relatively small. Repeat business made up only 28% of total volume, though 80% of customers were high-volume brokers. Low customer satisfaction, retention and repurchase, coupled with low employee loyalty, led this lender to work on improving its customer focus, and enhancing customer experiences and relationships. Approach: Quantify relevant Touchpoint MetricsSM to support Six- Sigma Quality program for service. Significant voice-of-the-customer and process mapping data existed, but company leaders surmised the organization didn’t have a solid understanding of which touchpoints were key to the sales process, and which were most important to delivering an optimal customer experience. The McorpCX and client team began by identifying, gathering and analyzing all available voice-of-the customer and process mapping data. Then we defined existing processes for experience delivery, with the goal of understanding current systems, including team member roles and responsibilities for experience delivery. We then underwent Touchpoint Mapping®, including internal research across regions and functions, as well as external research across segments. 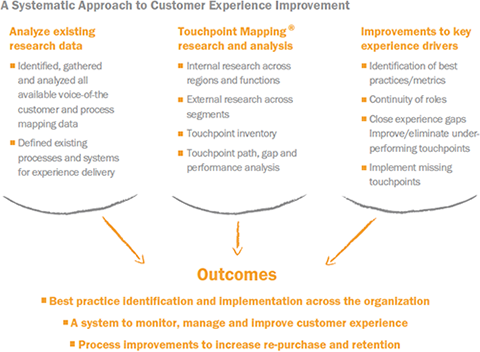 Through these interviews and our analysis of existing data, McorpCX developed a touchpoint inventory, including both known and “unknown” touchpoints, their perceived value, performance and importance. We also identified customer levers and needs within each stage of the Customer Relationship Lifecycle, providing the team with a 360 degree perspective on, and metrics to define, the entire customer experience. Analysis highlighted touchpoint paths, gaps and disconnects, redundancies and overall performance. 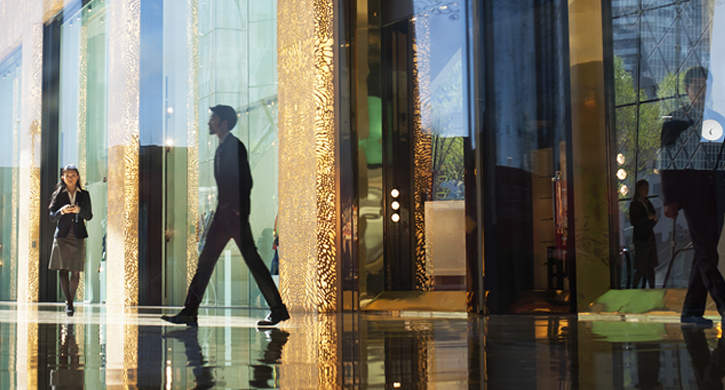 Findings: Differing assumptions of an optimal customer experience. The organization did not understand wants and needs at different stages of the customer relationship lifecycle for either direct (owners) or indirect (broker) customers. There was little knowledge around what interaction touchpoints actually existed, compounded by a lack of understanding of the value and efficacy of individual touchpoints. There were significant gaps between internal and external perspectives of touchpoint value, efficacy and performance. Most importantly, we found that the quality and consistency of the customer experience varied wildly from one office to another. Ironically, each region was leveraging Six Sigma Quality tools to deliver what they perceived as the optimal customer experience. One example of a needless disconnect was the secondary market handoff. Customers felt somewhat abandoned when their only notice of a new note holder was a form letter and new payment schedule from the new company managing the loan. Recommendations: Identify and adopt best practices internally, and improve underperforming touchpoints. Among several prioritized recommendations, we focused on defining roles and responsibilities of loan team members in support of the customer experience. We also defined best practices organization-wide, and implemented these through a series of “road show” presentations, Touchpoint Workshops, and train-the-trainer sessions. Processing and loan servicing changes focused on delivering a consistent experience that addressed specifically identified customer wants and needs. Results: Dramatic increases in employee and customer satisfaction, and rising loan volume. As a result, major experience and process gaps were quickly addressed both internally and externally. Touchpoint teams, initially trained by McorpCX staff, monitored and improved customer experience efforts organization-wide, integrating touchpoints into Six Sigma Quality programs. In addition to driving early successes, efforts over time drove significant and systemic customer experience improvements, increasing employee and customer satisfaction and loyalty, retention and repurchase, and boosting overall loan volume.